"Walk with giant steps along the way of holiness to which you are called." These words of Mother Clelia Merloni remind each one of us that we are called to be a part of God’s plan. Discernment is a time of prayerful listening, open dialogue, and free response to God’s invitation. We offer the following pages and events, along with our prayerful support, as you embark on a journey with our loving God. 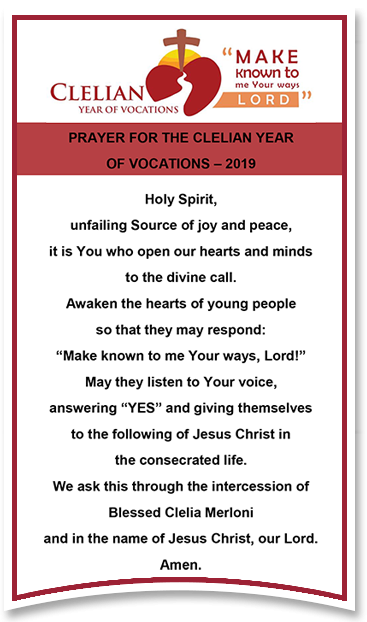 During the 2019 Clelian Year of Vocations, we ask you to pray, through the intercession of Blessed Clelia, for all those whom God is calling to the consecrated life.